A large Heartless whose stout body makes it hard to topple. Be careful when you interrupt or block its attacks, as it'll become very angry! It is immune to fire magic, so defeat it with ice magic! The Mad Ride is an Emblem Heartless that appears in Kingdom Hearts II Final Mix. It is an alternatively colored, slightly stronger Hot Rod that appears in the Cavern of Remembrance. The Mad Ride is meant to resemble a cartoonized version of real-world cars. Its body is primarily red, and its roof is black with orange flames and a bent, black antenna on its top. Its four black tires are set rather close together and have purple hubcaps, and its fenders are silver. 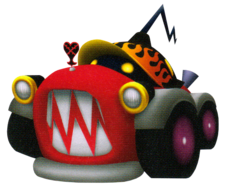 The white grill of the car acts as the Heartless's sharp-toothed mouth. It also has two headlights with yellow tips that act as its "eyes", though it has actual, glowing yellow eyes set in its black windshield. Its Heartless emblem is actually its hood ornament. The Mad Ride's name references its berserk, erratic rages when it is low on health. A bumper is a part of an automobile designed to help it withstand the impact of a collision. Unlike the Hot Rod, the Mad Ride executes all its moves at a much faster pace, attacking more relentlessly than ever. When half of its HP bar is depleted, a purple aura will appear around it. It will rev up and rush towards Sora, and if he is in the way, it will send him flying. It does this rush attack thrice, and pauses for a while before it begins rushing towards Sora once again. In all cases, when it attacks Sora, immediately Guard, then use Counterattack to stagger it. When the Mad Ride rushes at him, a well-timed Guard or High Jump can save him from being sent flying. Alternatively, use a well-timed Reflega. Also take advantage of its weakness and use Blizzaga early on to defeat it quickly.